Some time around the end of 2013 I was requested to make these pitches for a turn based game with one golden rule about the player controlled party moving together as a single unit each time end turn was pressed (unlike most games where you can move your units one by one individually.) 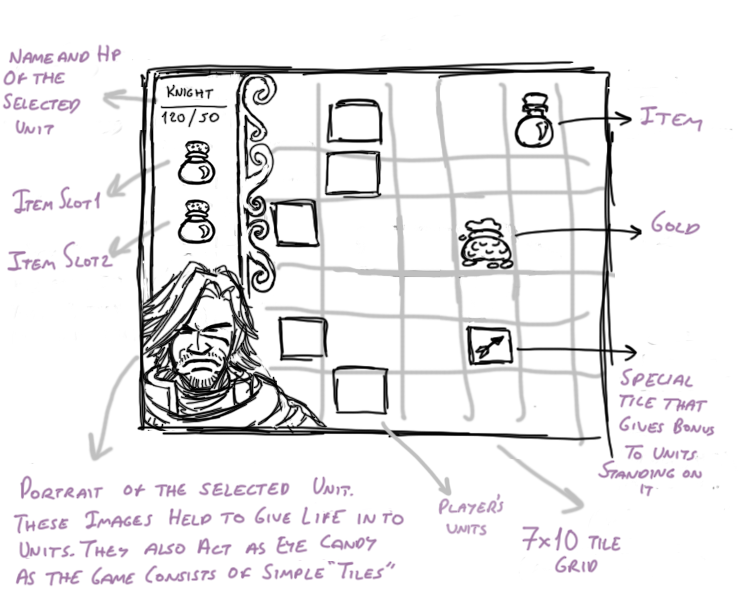 and was left to work over it along with couple other aspects of a casual strategy game design. 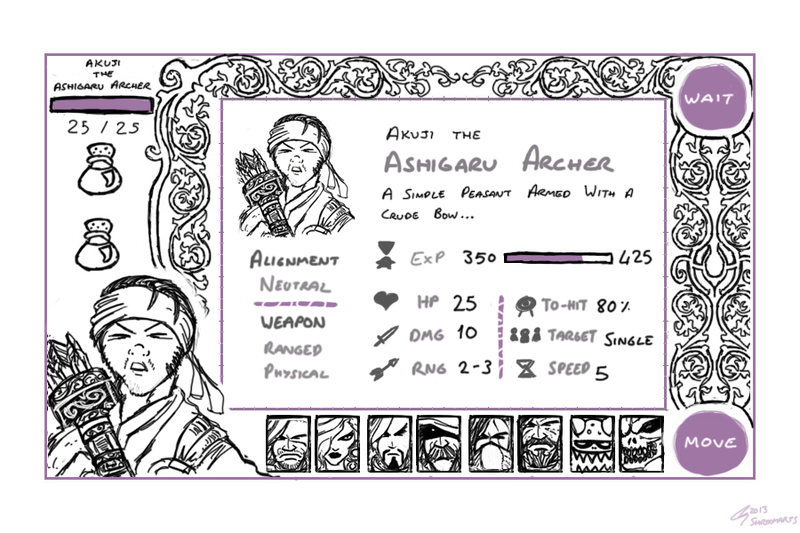 So I spent some time to come up with a game where the player took control of a band of adventurers & mercenaries, who travel each map from left to right, kill stuff, collect loot, stop in towns, buy more stuff to kill more stuff and collect more loot. Time has passed and the project never got the go and now it is certain that nothing will become from these any more so i decided to brush the dust off them and post them in the blog. What the player can do is very limited (walk, wait, rearrange party position, equip / use items, buy sell stuff and thats about it) so this limitation may put strategy fans off. But it isint meant to be something to spend lots of minutes thinking who will move where while who kills whom. Its more like a coffee break thing. However it feels very open to transformations, with a couple of modifications and additions here and there this can be turned into a fun game, be it strategy, grinding or simple click fest. It also has a couple of unanswered questions regarding game mechanics that I should iron out but i’ll just post it as whatever it was meant to be at the time I made it. Why is an adventuring party sent and not an army instead? I’ll just make something up real quick for now. The player starts with a party of 4 very weak units (a band of young ragtag bandits) as they wander the first level which acts as a tutorial to get used to the - already dummified - walk / wait mechanic, unit placement & swapping, and stuff such as topography and tile bonuses. Anyway the party kills a few enemies (probably wild animals and such stuff found inside forests or other bandits and similar thugs) until they visit a town along their path. They stop to quench their thirst in the towns tavern and hear gossips about a comet that falls on the border of the Empire and how it is seen as an omen by the people of the empire. Young and foolish, in lust for adventure they pack their stuff and head off towards the comets crash site only to find demons, undead and more nonsense denizens i cant really think of at the moment. 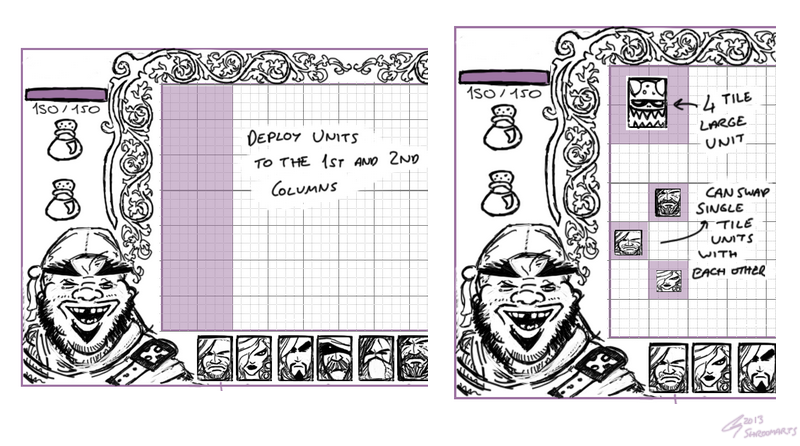 Concepts below were done for 800x480 resolution, 7x10 map tiles 50px each. instead of a minimal UI, I went for a chunky one with unnecessary decorations and stuff to cover the missing eye candy as the game tiles will look simple and weak. I was lazy with the decorations so went for medieval style patterns but it could be lions, angels, shields, skulls & bones whatever. If the Asian theme is used then probably cherry orchards or colourful & hairy dragons would suit best. If they all walk at the same time what happens when an enemy blocks the way of a party member for a few turns? They will probably have to stop until the blocking enemies (or blocked party members) are killed. Player can arrange the lineup of a single party member once per turn to make sure units dont get stuck or units cover each other / gang on enemies etc. 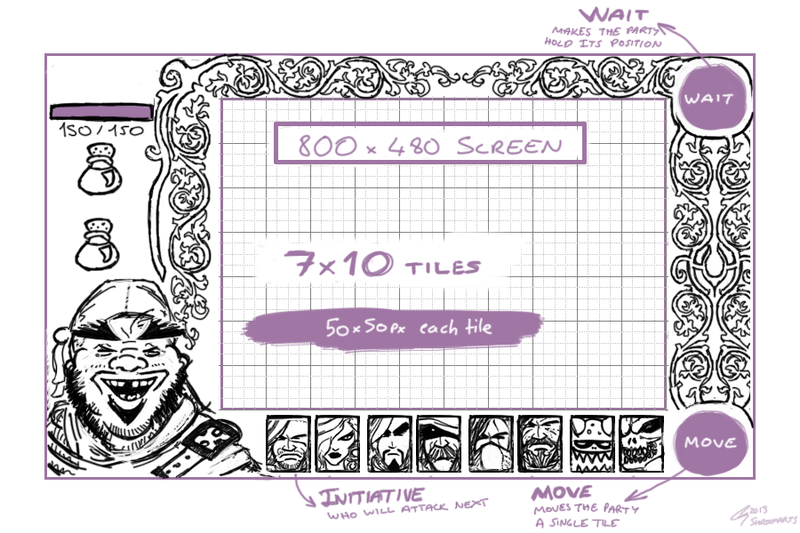 Players can arrange the party line-up by dragging & dropping members on empty tiles or swap their places with other party members as long as all party members are placed in the first 2 columns from the left. Party members can have a couple of alignments (neutral, good, evil) so good and evil aligned units will have penalties when standing next to each other while evil evil or good good will have bonus. Different units have different attack patterns, melee units hit the tiles directly in front, wizards hit all enemies in range, archers cant hit directly next to them but can shoot 3 tiles away etc. Ranged units or units with low HP should be placed behind high HP melee units to protect them from damage. Game map has various tiles. Each tile bestows different (positive and negative) buffs to the creatures standing on them. Stuff below are unimaginative, common examples. The deal here is to make sure the player clearly understands why the units gain positive or negative bonus on these tiles by looking at them so i kept it all generic. Maybe after each town the player can pick a new direction to travel from a node based world map. The player's party will consist of a maximum of 6 members. Each party member will have their own name and stats. Each can carry a maximum of 2 items that can be used in battle. As it consists of mercenaries the party does not fight for free. It costs the player gold to recruit units and gold to maintain them. 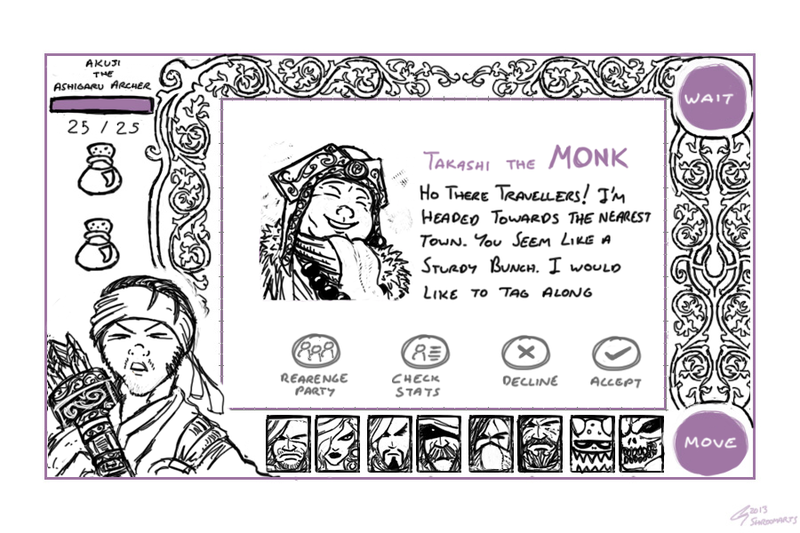 Each time the party reaches a town the player will have the option to buy or dismiss members. Some party members will also leave the party if they decided they had enough action or if they dislike another member of the party. Dead members continue to travel with the party as long as there is at least one member is still alive. Dead members can be resurrected in towns but such action will require gold depending on the units level so sometimes it may be more feasible to bury them instead of resurrecting. Dmg: Damage caused with each hit. Rng: How far the unit can hit. Weapon Type: Melee, ranged, magic etc. Some creatures are only effected by magic, some have resistance to ranged attacks etc. Targets: Number of enemies that can be damaged with each hit. Speed: Since all the party members walk a single tile at the same time this would show which party member (or enemy) will attack first per turn. Apart from these general stats, each creature can have their own special powers and skills. Units are awarded experience for fighting. After obtaining enough experience, they will advance a level and become more powerful. The amount of experience gained depends on the level of the enemy unit killed. 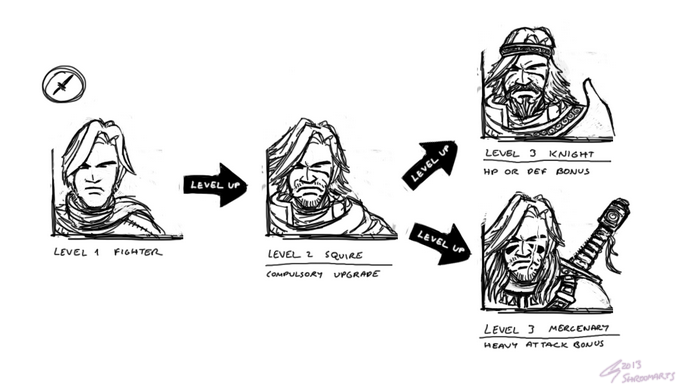 Each time a unit levels up the player will be able to choose one of the two paths for the unit. For example an archer will have the option to turn into a longbowman or a crossbowman once it reaches level two Each path will have its own pros and cons. After each level the units portraits will change. A high level unit will still resemble its low level version but will look much cooler and battle hardened with scars and similar stuff. They will also start to ask for more upkeep and there will be a chance for them to call it quits once they reach the nearest town. A level 4 unit will have a chance of 40% to leave the party once they reach the town etc. Unit level times 10 or unit level times 0.5 can be an ideal way to calculate the possibility of units leaving the party. This game mechanic will force the player not to rely on higher level units. It would also cut the bond between the player and the party members (which may be a bad thing - why care to level them if they will leave you?) but adding a high variety of different units can solve this problem by making the player want to explore new units instead of picking and levelling the same ones again and again. Depending on the story sometimes special characters can be added to the players party who will depart after a special event etc. There will also be travellers who would tag along with the players party (assuming there is enough space) until they reach their destinations. 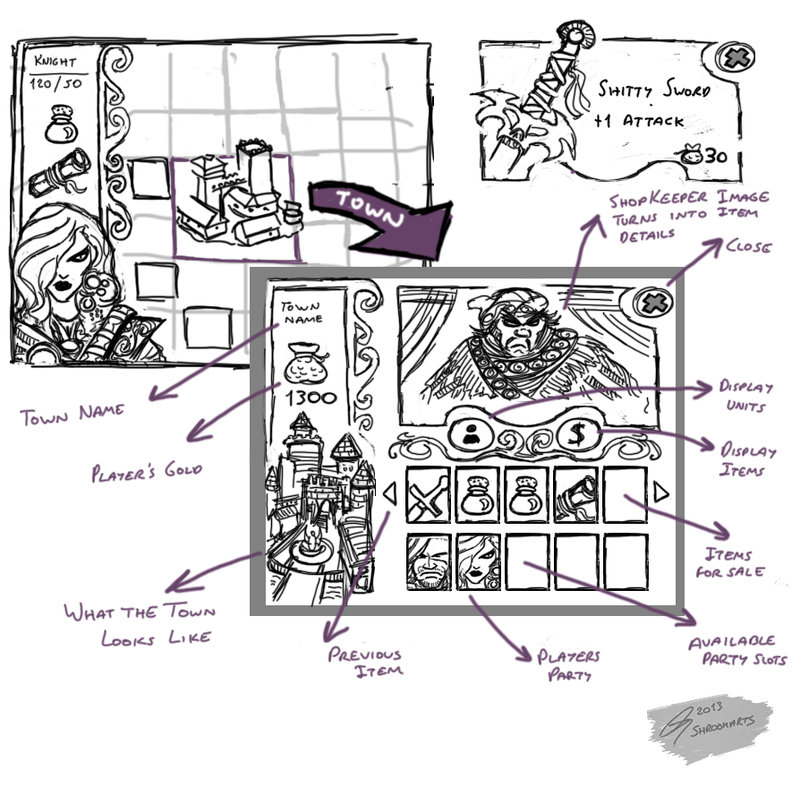 Various items can be found during the parties adventures. Most items will be single use consumable potions or scrolls etc. Each party member can carry / equip up to 2 items. Similar to high level party members, I dont want players to save lots of items, so the two item limit can force the player to use the unnecessary items instead of hoarding everything forever, waiting for the "right time" to come. Potions - various single use potions used for healing, removing poison, resurrecting etc. Scrolls - single use offensive and defensive buffs for members, stuff like spells for ranged attack, resurrect etc. Weapons and armours - gives small amounts of attack of defence bonus as long as they stay equipped in each party members item slots. It should have a few limitations such as archers cannot equip melee weapons, wizards cannot equip ranged weapons etc. Valuables - stuff like crowns, sceptres, diamonds etc. These consume a slot in members inventory but they are worth lots of gold once brought to a town. Game is won by completing various story related objectives.